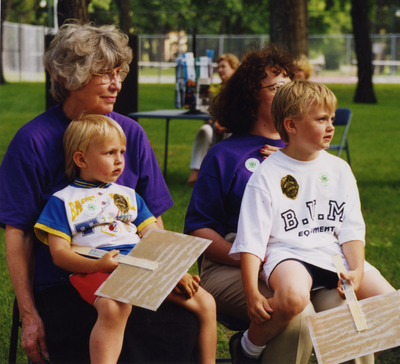 "A True Friend of Children"
A young child sits on Lieutenant Governor Rosemarie Myrdal's lap while attending "Stand For Children" in Fargo in 1998. An unidentified woman sits next to her with a child on her lap. Caption on back of photo reads: "'True friends' of children! Stand for Children, Fargo Island Park."